There are two different volunteer opportunities associated with the upcoming Wet-Dry Mapping of the San Pedro River in middle June. One role is a smaller commitment of time, while the other is more expansive and involves taking on greater responsibility. First, the Friends are looking for an additional volunteer to help with team packet preparation and in addition meal planning and setup for the dinner for Wet-Dry teams that attend the training event the evening prior to mapping in the field. This volunteer position reports to the Friends and involves a total of 5-10 hours of time between now and the June mapping event. The second and larger role involves coordinating volunteers between now and June who will join teams in the field in the SPRNCA and upper San Pedro Valley tributaries the day of the mapping event. See the volunteer position description. Attendance at several planning meetings is also required. This position involves a commitment of roughly 50 volunteer hours between now and June. This volunteer reports to The Nature Conservancy Wet-Dry Mapping event coordinator Brooke Bushman. 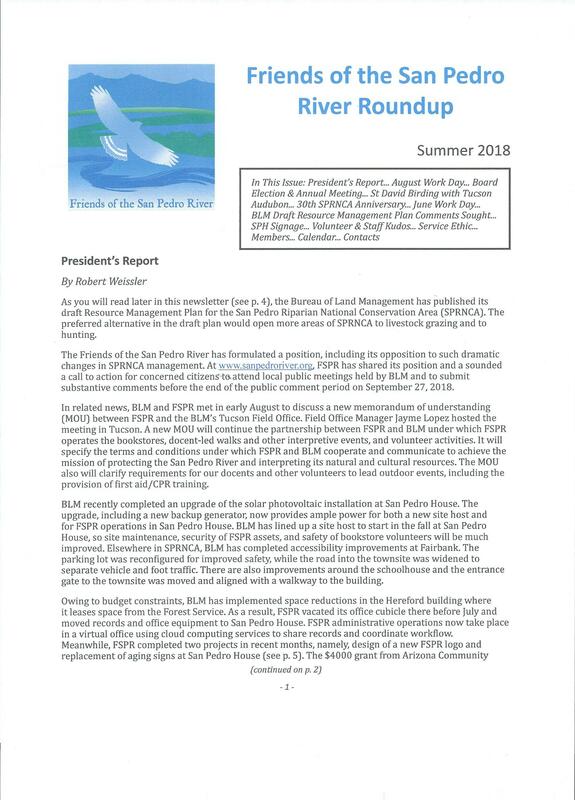 The actual Wet-Dry Mapping of the San Pedro River will take place on Saturday, June 15, 2019. The Wet-Dry Training at San Pedro House is scheduled for the day before, namely Friday evening, June 14. If you are interested in one of these two volunteer opportunities, please email fspr@sanpedroriver.org to indicate which one, how much time you could devote between now and June, and what travel or other commitments you have in the next few months. On behalf of the Friends, THANK YOU to all the volunteers who do so much for the river! 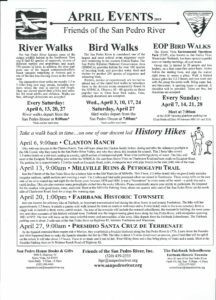 Take a look at events coming up in April and plan your visit to the river! Here’s what’s been happening on the river! 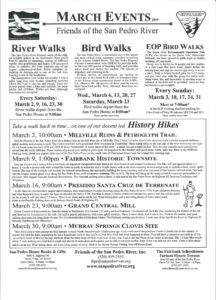 Check out our March events flyer and plan your visit to the river! 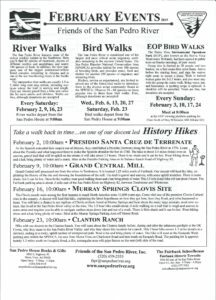 Check out our events flyer for February, and plan your visit to the river! Check out events coming up in January, and plan your visits to the river! 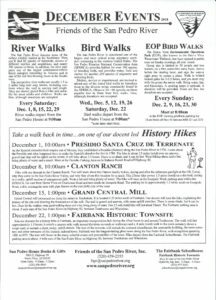 Support the river in the New Year! 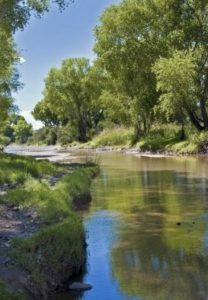 This year has been an eventful one as the San Pedro Riparian National Conservation Area (SPRNCA) reached a significant milestone, namely the 30th Anniversary of the Arizona-Idaho Conservation Act of 1988 that created it. We celebrated that milestone in November with FSPR founders, members, volunteers and with BLM staff past and present down at San Pedro House. 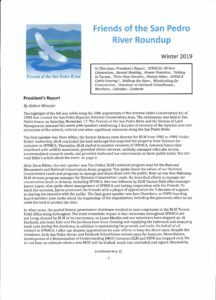 Let’s start 2019 with the same resolve to support the river! 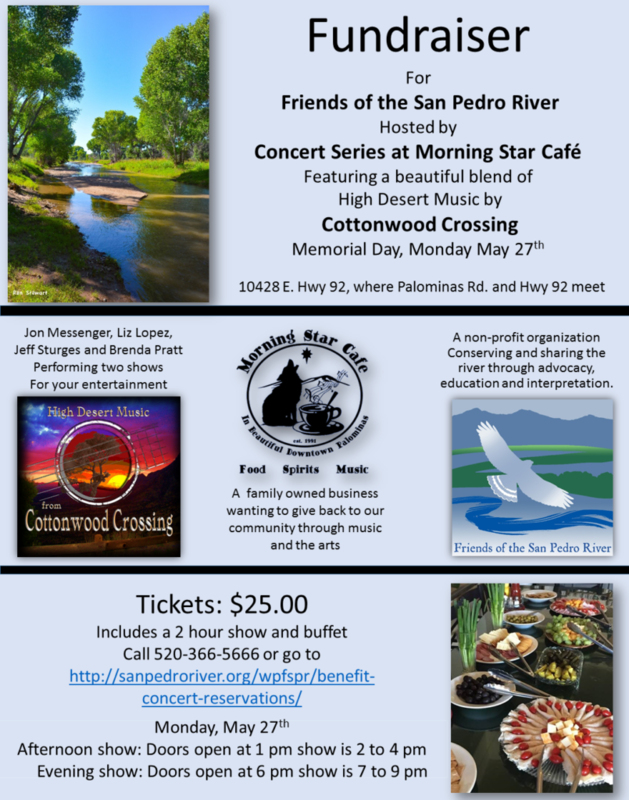 Please consider a year-end gift to the Friends of the San Pedro River to support our education program, our docent-led interpretive walks, and our volunteer trail maintenance and clean-up events. There are many ways to give. Besides the PayPal donate button and the Razoo/Mighty Cause donate button, you can shop at Amazon Smile and Amazon donates to FSPR. Or shop at Fry’s (sign up for organization # II206 to give to FSPR through Fry’s Community Rewards program). Or donate for a personalized brick in our Dedication Walkway at San Pedro House by completing and mailing the application. And we always appreciate the time donated by our many dedicated volunteers – Contact us to get involved! We are grateful for all your support. Happy Holidays and all the best in the New Year!! Check out our events flyer for upcoming events in December! Summer 2018 River Roundup Is Here!